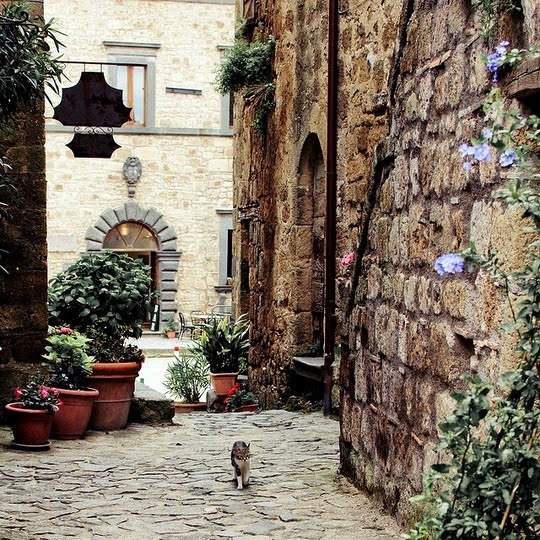 Strolling through the almost three-thousand-year-old alleyways of Civita di Bagnoregio in Italy, this traveling cat is probably looking for one of the many trattorias this Etruscan hilltop town has to offer. What a pretty place to take a stroll. We so would love to be there. Have a marvellous Monday. That sweet one sure has a nice place to hang out! So beautiful! The absolutely best pasta I ever had in my life was in a little side-street restaurant in Cinque Terre. I still dream about it, LOL! We went to Elba some years ago and there were many cats all round the restaurants there hoping for some tasty bits of fish and chicken. I would love to be there too. Pour off most of the wine? I hope you don't pour it away. What a cute Italian kitty! I've never been there but have been to Florence, Venice and Sienna. The food is so good! I have not been to Bagnoregio - but gnocchi is my favorite food, and this little guy is looking for the right stuff! OT: ik pluk die zwam niet hoor, laat staan dat ik 'm zou opeten! What a beautiful place. I've never visited Bagnoregio, but would love to some day! Chestnuts cooked in wine, what could be easier?! That is a gorgeous photo! My favorite Italian dish is Gnocchi Sorrentina. Wow, easy and potentially fabulous - all at the same time! Great post. Roasted in wine - yum! Being married to an Italian, we mostly eat Italian food too ! I really don't know what is my favourite one ! Oh it looks just beautiful there! That chestnut recipe sound interesting. Wonderful detail on the building. I enjoy tomato slices with mozzarella and basil, but I'm not sure if that's real Italian thing or not. Lasagna is great. Haven't had that in forever. Cool! I have not yet tried to cook chestnuts! Such a beautiful place for a cat (or anyone, for that matter) to have a walk! I used to love those when the street vendors in Paris sold them wrapped in a cone of old newspaper. Warmed the hands and tasted delicious on a cold day. Thank you for participating. I love chestnuts. My favorite Italian dish is any sort of pasta with marinara sauce. That sounds like something my hubby would enjoy. Great photo! Love Italy and want to visit again!